For most in the ad and marketing industry, attending the Cannes Lions International Festival of Creativity is on the career bucket list. It’s been a goal of mine ever since I started in the ad agency business as a new business intern. Back then, Cannes was an event seemingly reserved for creatives and agency C-suite executives, so I didn’t know if my path in business development would ever take me to the Croisette. But today, we all know Cannes is just as much about networking and deal making as it has about celebrating creativity. So when given the incredible opportunity to make the trip last year, I couldn’t pass it up. Prioritize in advance, but don’t expect to get it all in your first year. Yes, you will make a schedule, filling up your days with client meetings, partnership dinners, keynote addresses, and maybe a few or several parties. But it’s smart to decide in advance what your goals are and what you really value, so you can avoid getting overwhelmed by adding to your already booked schedule. Remember -- there’s always next year. Industry blasphemy: leave at least 3-4 hours open on your calendar every day. In trying to maximize your trip, you will inevitably feel the need to book every minute of every day. Don’t. The beauty of Cannes (besides the obvious), is that everyone in the industry is in a very concentrated place. Take my advice and leave enough open windows in your schedule to say yes to a few spontaneous invites. Those new friends, or clients, you meet at the Majestic Hotel pool may prove just as invaluable as what you heard that afternoon at the Palais. Buy the badge and pick it up your first day. Surprisingly, one of the things most debated about Cannes is if it’s worth purchasing a Festival badge. While it may not be completely necessary for everyone, if you are with an agency, buy one. And pick it up on Day One. It is tempting to bypass purchasing the badge, thinking you can get a download from press reports or colleagues. But realize, even outside the Palais, there are events which require a badge, and if someone (eh hem, like a client or prospect) invites you to go, you don’t want to say no. Balance your time inside the Palais and on the Croisette. Spend some time seeing the creative; it’s the heart of Cannes. There has been a massive shift over the past few years from a focus on creative to a focus on ad tech. This is even evident inside the Palais, with more sessions focused on innovation and data. Outside, you will find every ad tech player in the space clamoring for your time and attention. 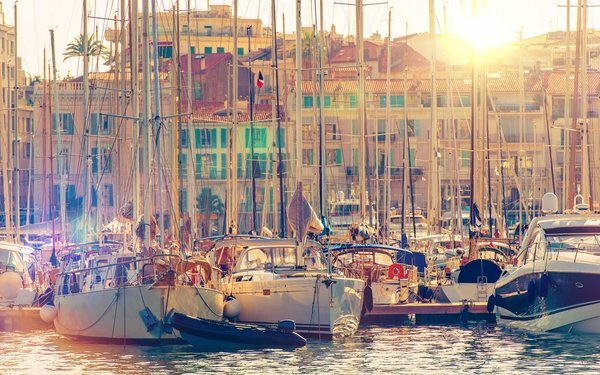 From Facebook Beach, to Snapchat’s pop up space, and all the branded cabanas and yachts in between, mingling on the Croisette is where you should spend much of your time. Meet as many people as you can and start a conversation. Have an opinion, share and debate your ideas, and you’ll be surprised what ensues. Learn un peu de français. The Cannes Lions Festival of Creativity is a wonderful, exciting and valuable experience. It is the event for our industry. It is a great place to be inspired, make connections, and to remind yourself why you got into this business in the first place. Our industry is an incredibly diverse, talented group of people with a shared passion for shaping the future with their craft. And nowhere does that feel more evident and more of a worldwide experience than during this sunny, rosé-infused, hectic week in the South of France.